What is the ultimate purpose of being a Christian? As the Westminster Shorter Catechism puts it, “To glorify God and to enjoy him for ever”? To win others for Christ? To live a life of love? To live a holy life? To serve the Lord, using whatever gifts you have been given in service of others? To work hard at transforming this broken world? Paul, I think, would affirm most of the above. But I also think that he would subsume them under his primary concern for the believers under his pastoral care – that ‘Christ is formed’ in his ‘dear children’ (Gal.4:19). In this sense, the goal of the Christian life is spiritual transformation – to be conformed to the image of the Son (Rom.8:29; 2 Cor.3:18). And this transformation happens in the context of relationship with God and others – in the power of the Spirit. It is the Spirit whom God sends into believers’ hearts and who enables them to call God abba (Gal.4:7). This conforming of human beings to the crucified and risen Christ is a unitary action of the whole Trinity, and indeed seems to realize the most interior and primal purposes of the triune God. The Father has eternally and effectively willed – predestined – our conformity to his Son (cf. Rom. 8:29; Eph. 1:5), who, by accepting incarnation and the death from which the Father raises him, constitutes that original form of which we are the intended images. The Spirit is the agent who, poured out from the Father by the risen Son and dwelling in us, immediately joins us to Christ and makes us his icons (see Rom. 8:9-11, 14). The New Testament of course talks about the outcome of Jesus’ resurrection in many other ways, but the notion of “bearing the image of the man of heaven” seems to express both the final aim and the original intention not only of the resurrection, but of the totality of divine acts involving creatures. While for now we are icons of the risen Christ in fragmentary and partial ways, in the end the Spirit will enable us to see him as he is, and so be as much like God as it is possible for creatures to be (see Jn. 3:2). With the perfection of this work of the Spirit will coincide the liberation of all creation; no further divine aim for creation will remain to be realized (see Rom. 8:22-3). B. Marshall, 2000. Trinity and Truth. Cambridge : Cambridge University Press. Wonderful – the astonishing agenda of the triune God is personal and cosmic redemption. And radical – Marshall says God’s goal is that believers are “as much like God as it is possible for creatures to be.” Possibly – though I’d put it differently. I think the goal is better put that they will be as fully human as it is possible to be. Humanity without death, sin, selfishness, violence and hate. Humanity with love, wholeness, relationship, service, joy, self-giving and creativity. Humanity, in other words, as embodied by the living man Jesus Christ. Humanity which has been remade in the image of God as it is conformed to the image of the Son. R Paul Stevens has done a lot of reflecting and working on work. 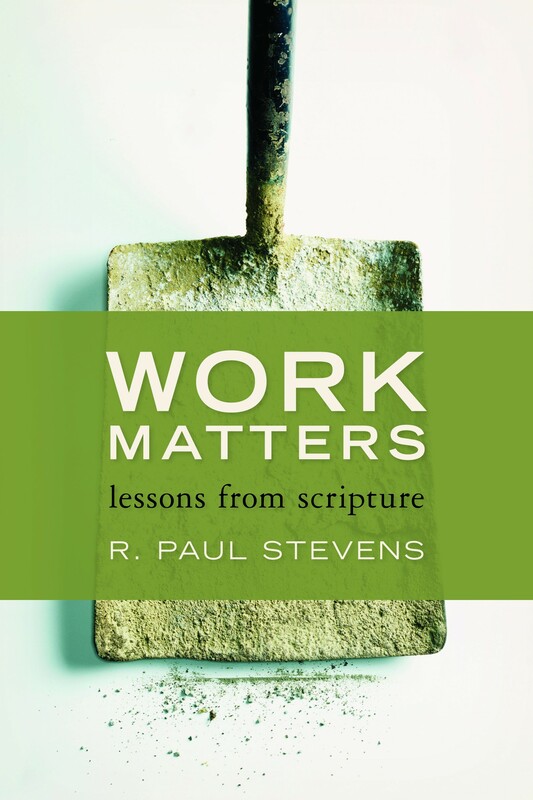 He’s written a nice wee book called Work Matters: lessons from Scripture, which takes the form of a series of short reflections on work and various biblical characters. And he has given both him and Oholiab son of Ahisamak, of the tribe of Dan, the ability to teach others. 35 He has filled them with skill to do all kinds of work as engravers, designers, embroiderers in blue, purple and scarlet yarn and fine linen, and weavers—all of them skilled workers and designers. The Spirit enables people to teach others how to work to create beauty, as well as the wisdom, understanding and knowledge needed to get a good job done. Stevens’ argument is that, while this sort of Spirit enabling is rare in the OT, in the new covenant, the Spirit gifts his people for working ‘personally, universally and permanently’. What is God calling you to work at? Or to put it another way, do you see your work as a calling from God? The place God calls you is the place where your deep gladness and the world’s deep hunger meet. What work have others affirmed you in? How does your work involve serving others as an act of worship and love? How can we see work as a place to enrich human life and create beauty? – in cooking a meal, in talking with a student, in cutting hair, in creating jobs ..
T David Beck’s thesis in his book, The Holy Spirit and the Renewal of all Things: pneumatology in Paul and Jurgen Moltmann, is that much Western theology has failed to do justice to the comprehensive and central place of pneumatology in the New Testament. If one response has been the ‘institutional tendency’ (e.g. Barth) driven by Christology and ecclesiology and an ‘experiential tendency’ in response (e.g. Wesley), Beck argues both don’t adequately capture the NT’s framework itself. NT pneumatology is not driven, he contends, primarily by Christology, ecclesiology or experience, but by eschatology. All NT reflection on the Spirit operates within an eschatological framework. He goes for an inaugurated eschatology of the ‘already’ and ‘not yet’ most identified with G. E. Ladd. He doesn’t critique Ladd (and there is room for critique), but the main problem he wants to highlight is how within much systematic theology, eschatology is often reduced to study of the future: topics like the parousia, resurrection, judgement, heaven and hell etc. All things that are yet to happen. But this, Beck says, fails to grapple with the overlap of the ages so predominant in Paul and elsewhere in the NT. Yes there will be future consummation of God’s kingdom rule, but this rule has already begun. If the present age is the eschatological age ‘broken into the present’, then eschatology is ‘here and now’ and not just future events yet to unfold. 1. A distance and alienation from the strong sense of climatic fulfillment within the NT. A Christian faith lacking a strong sense of how God’s promises have been fulfilled in Jesus, is one detached from the joyful tone of most of the NT. 2. The NT’s strong continuity between promise, fulfillment and consummation disappears. For example, while Christians may hope for resurrection to come, it tends not to be seen as a natural extension of the blessing of new life already given in the here and now. 4. When eschatology is marginalised, an anemic pneumatology tends to follow. This is seen in Western theology’s subordinationistic view of the Spirit. ‘This age’ is seen as the waiting time between the two appearances of Christ (what Beck calls ‘the rickety bridge between two strong towers’), rather than an age of the promised Spirit who has been poured out for many. Rather, Beck rightly argues, pneumatology and eschatology are inseparable: the ministry of the Spirit is evidence of fulfilled OT promises in the experience and writings of NT believers and as tangible anticipation of the future work of the Spirit in the consummation of God’s kingdom. If you are a Christian, how much do you understand yourself already to belong to God’s new age; as already having new life through the Spirit? How does this give you joy, assurance and hope, even in the midst of struggles with doubt, disappointment, mundane work, tiredness and weakness? The other end of the spectrum within Western pneumatology to the institutional tendency is what T. David Beck calls the ‘experiential tendency’. If Barth is an example of the former, John Wesley is an example of the latter. His conflict with the Anglican Church of the day revolved to a large degree around his view of the Spirit in the Christian life. Wesley was charged with being an ‘enthusiast’ (a bad thing to be obviously). Wesley’s influence has been every bit as significant as Barth’s. His holiness theology was one of the inspirations for the rise of the modern Pentecostal movement, now the largest and most dynamic sector of global Christianity. If justification is what God does for the believer in and through his Son, sanctification is what God works in the believer by his Spirit. If the Christian life is a battle between ‘flesh’ and ‘Spirit’, the Spirit can win the struggle. The believer can therefore reach a state of ‘perfection’ – which in Wesley’s terms means loving God with all of our hearts, mind, soul and strength. In this state of perfection, or entire sanctification, there is no room left to commit wilful sin. Wesley emphasised unique functions of the Spirit. One was assurance through the inner witness of the Spirit. Another was an experience of the depth of God’s love for the individual believer. He talked about a ‘sweet calm’ satisfaction of knowing God’s grace. The indirect sign of the Spirit’s transforming presence is the fruit of the Spirit – affections like joy and peace and love. The big point here is the experiential role of the Spirit in transformation – whether assurance of being a child of God; overcoming deliberate sin; or seeing his fruit as a visible witness of his presence. Wesley never stopped insisting on the perceptibility of the work of the Spirit in the day to day of the Christian life. It is this experience of the Spirit that is the key to preventing Christianity from sliding into formalism and institutionalism. In other words, this is a theology of encounter with the Spirit. The Spirit’s work is distinct from, and complementary to, that of the Father and Son. A quick read of the previous post gives a sharp reminder of how different Wesley is from Barth. – The Spirit’s ministry is therefore tied too tightly to the present time – with little reference to the OT and to eschatological hope. – And if Barth is overly Christocentric, Wesley could be charged with being overly ‘pneumacentric’ (to make a word up). And it’s no surprise to see this tendency emerge in some forms of Pentecostalism, where there is a search for spiritual experiences of the power of God as a key to revival. Beck’s overall argument is that neither ‘bipolarity’ of Barth or Wesley is adequate to do justice to the NT witness of the Spirit. I’ll try to summarise his path between them in the next post. Been doing a bit of reading and research over the last while related to the Spirit and Paul including The Holy Spirit and the Renewal of All Things: pneumatology in Paul and Jurgen Moltmann by T. David Beck. Beck starts with a bang: consistent with the Filoque clause in the Nicene Creed (the Spirit proceeds from the Father and the Son), Western Theology has struggled to develop a consistent and biblically robust theology of the Spirit. He identifies two opposing tendencies: the institutional and the experiential. I’ll look at the first in this post which has been reflected in Luther, Calvin and the institutional churches of the Reformation. The Spirit’s location is in the sacraments and in the Word. But more than this, the Spirit is tied to Christ, as an agent through whom the atonement is applied to believers. This leads to a subordinationistic tone to Western Protestant pneumatology. The Spirit’s work is tied to ecclesiology (Word and Sacrament) and acts as a function of the church and of Christ. Beck argues that Karl Barth’s pneumatology is a classic example of the institutional tendency. Take his doctrine of Revelation, corresponding to the Trinity: God the Revealer makes known his Word, the Revealed, to humans. The only way for them to know the Revealed is through divine revelation, the Holy Spirit, God’s Revealedness. In Barth, the Spirit is the revelatory bridge between sinful humans and God. It is God alone who enables and empowers people to know him. Only through God is God known. This all sounds fine does it not? What is the problem for Beck? We’ll get there. Barth, of course, has no time for natural theology. Revelation is the event where Scripture becomes ‘the dynamic and effectual Word of God’. The Word reveals Christ. The role of the Spirit is to make this happen. The Spirit’s role is to enable believers subjectively to know God, based on the objective work of Christ. became his body and they became its members in the fulfillment of their eternal election on the cross of Golgotha, proclaimed in his resurrection from the dead … there can be no doubt that the work of the Holy Spirit is merely to ‘realize subjectively’ the election of Jesus Christ and his work as done and proclaimed in time, to reveal and to bring it to men and women. So the Spirit is the one who brings to historical reality the eternal hiddenness of believers’ prior election in Christ. Yes, the church can only exist because of the work of the Spirit. But that church, for Barth, is already the body of Christ. The Spirit, for Barth, is ‘wholly and entirely’ to be regarded ‘as the Spirit of Christ, of the Son, of the Word of God’ (CD I.1:452.) The Spirit is the power of Christ, whose ministry is orientated around revealing Christ and uniting believers to Christ. So Barth can say of the Spirit ‘But fundamentally and generally there is no more to say of Him that He is the power of Jesus Christ ..’ CD IV.1:648. This leads to Barth virtually merging the work of the Spirit and the work of Christ to a point where it is difficult to see any distinct agency for the Spirit. Barth can say that Jesus attests his own reconciliation to us by the Spirit. He calls believers by the Spirit. He can even talk of the Spirit as the arm of Christ in his self-revelation to humanity. Even that the presence and gift of the Spirit are directly Christ’s own work. Such ideas tend to depersonalize the Spirit. There is a lot to appreciate about Barth’s Trinitarianism: Father, Son and Spirit all work in harmony and grace in revelation and reconciliation. No-one can know God but through the subjective work of the Spirit. Rightly he stresses the intimate and inter-related work of Christ and the Spirit and how they are related to the Father. However, if the Spirit is functionally identified with Christ, the result is a pneumatology submerged within Christology. Another word for this is subordination. As Beck puts it, the Spirit ‘tends to evaporate as the third person of the Trinity, appearing instead as a thin veneer of Christ’ (7). Lots of people I’ve talked to recently find the world of work a tough place. A hostile work environment, a domineering boss, relentless productivity targets, predatory competition from fellow workers, deep job insecurity, reduced pay and conditions ..
Work can be fascinating, challenging, enjoyable and satisfying, but it can also be a lonely and dispiriting experience. We seem to be created to want to make a difference – we want our work to be meaningful. And this connects to the nature of the work being done. Is it good work? What is good work anyway? Or am I just a cog in an impersonal multi-national machine, itself an organisation that may be doing a lot of bad work (e.g., unethical exploitation of people and resources) globally? I hope to reflect some more on the world of work and a theology of work. To begin, this post offers some musings on why church preaching and teaching tends not to have a lot to say about the world of work (and you might disagree with that assumption). – Clergy / pastors / church leaders tend to inhabit a religious world and don’t have that much personal experience of the daily and weekly challenges of work. – There is also a long and deeply entrenched dualism within much Christianity regarding work. ‘Religious work’ (being a pastor, a nun, priest, missionary, church related work etc) is of higher spiritual value than the ordinary secular world of work. Like the story of the secondary school teacher who takes a career break to go to Africa to teach children with a mission agency. The church puts her photo up on their global mission map beside the African country. They pray for her weekly and send round her prayer letter. On a visit she shares in church all that has been going on. However, on her full return, her photo is taken down, the prayer stops and she is never asked again what it means to be a teacher who is also a Christian. Within denominational churches especially, the whole business of ‘ordination’ to ‘the ministry’ shouts loudly of such a dualism. As does the elevation of the pastor / leader within many strands of Pentecostalism as specially anointed by God – sometimes this is married to scary levels of authority. I left a service a while ago where a leader was appointed feeling profoundly ambivalent about the whole tone and content of the event. Yes, a call and appointment to ministry of the gospel is a good thing to be celebrated and affirmed within the church community. But over-emphasis on ‘the’ leader and his/her unique call to Christian work, implicitly reflects an unhealthy dichotomy between the sacred and the secular and fosters reliance on the religious professional. I’m not against leadership per se, but I want to resist an explicit or implicit theology that suggests religious church work is the highest vocation. And I resist the notion that within church work, leaders are called to the most important and spiritually significant work. 3) A biblical theology of work where there is no sacred / secular divide – where both ‘spiritual’ work and ‘ordinary’ practical & manual work are ‘holy’. I’m delighted to say that last Friday 02 May, Irish Bible Institute had a very successful ‘validation event’ with York St John University (YSJU). This means that, once the paperwork is signed off, IBI will be in official partnership with YSJU. We design and deliver Certificate, Diploma, BA Honours Degree and Masters Degree in Applied Theology and students graduate with YSJU qualifications. The new courses kick off this September. It is very much a two-way partnership: the validation process has involved us revising and refreshing everything we teach. We’ve added a Youth Ministry track and a Christian Leadership track to the BA Degree and a Christian Leadership strand to the MA. The event on Friday was the culmination of discussion and work going back at least a year. The new partnership feels like a really good fit. YSJU have a long track record in theology and religious studies, particularly with the Church of England since it started out as a Diocesan College for teacher education in 1846. It became a university in 2006. YSJU has an outstanding reputation for teaching and learning and this fits well with our passion to deliver ‘excellence in theological education and leadership development’ in the Irish context. The panel last Friday consisted of academic and administrative staff from YSJU as well as a couple of external theological experts who asked plenty of tough questions. Achieving new validation has rightly been a very rigorous process; looking at everything including how does the degree structure and content actually ‘delivers’ the aims of the programme. In other words, HOW does a student actually learn and develop the skills and critical self-awareness relevant to Christian ministry? Lots of other things were also examined: physical resources, teachers’ qualifications, finance, future plans, assessment, staff resources and development etc etc. One of the most encouraging things about an excellent day was a long list of commendations we received from the Panel on the quality of what we have been doing. And this whole process has been a reminder of what a great team I have the privilege of working with at IBI. For a small college on limited resources, I think it’s pretty remarkable what has been achieved by the grace and provision of God. Wee theological point here: hard work and grace are not incompatible! It is merit and grace that don’t go together. What do you make of the idea of a secular university validating the courses of a Christian college? There is a long history of debate around this question, both in universities and in Christian colleges … and I’ll come back to this in a later post. But for now, we’re thanking God for answered prayer for a good partner to take IBI on to the next stage ….